Author: Jackson, Deborah Set In . . . Description: One of Canada's top scientists has discovered the secret to time travel. But something has gone horribly wrong . . . .
On the first day of school, in a new city, Sarah Sachs experiences the shock of her life when she sees a car drive right through a strange boy. Did she really see it, or was it a figment of her imagination? The boy? Matt Barnes, son of the world-famous physicist, Dr. Nathan Barnes. The figment? Not so imaginary. A powerful new technology that could be behind Dr. Barnes’s disappearance. Sarah becomes swept up in Matt Barnes’s life as she helps him search for his father. They uncover an unusual device in a secret laboratory—a device that throws them far from the modern city of Ottawa into the forest-matted land of the 1600’s. In this strange New World, they must contend with wild animals and somehow survive a war between the Algonquin and Iroquois nations. But eventually they’ll have to make a decision that might change the world as we know it. Should they meddle with time? 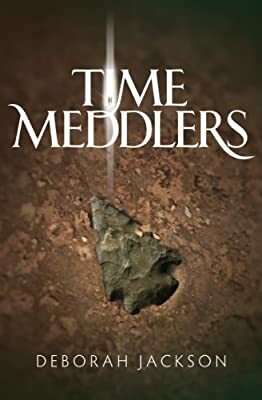 "Combining time travel technology, history and mystery, Time Meddlers is an enthralling science fiction story that transports readers from present day Ottawa back in time to the 1600s....Suspense, humour and memorable characters make this exciting adventure a page turner." "Recommended. The characters are very real, and the situations make the book quite a page turner. Can time travel change history? . . . Includes a glossary of Native tribes and terms, and a set of questions for reading groups."